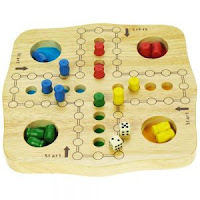 Ludo is another traditional board game for 2 to 4 players that has been played for many years. The game consists of a wooden board, different coloured pegs, dice and involves some strategic playing. Each player chooses a different set of coloured pegs and places them in their corresponding starting circle. A 6 must be thrown to start each peg on its way around the board and the player must decide which of his pieces to move in a clockwise direction around the track by the number thrown. If a player can get one of his pegs to land upon another of his pieces of the same colour this will form a block which cannot be passed or landed on by any opponent so giving him an advantage. Also if a player can get his piece to land on an opponents piece of another colour then that piece is removed and returned back to the start and that player must then throw a 6 to re start it on its way around the board again. To win the game a player must get all of his four pegs around the board and back into his coloured home column by throwing the exact number for each one to finish. This is a great toy for developing toddler's cognitive functions and logical thinking.